All day multiple groups of Brown Pelicans have flown over the San Clemente Pier in their usual elegant and brilliantly fluctuating formations. These “Coastal Commuters” are magnificent creatures and represent the best in flight. They are always an “air show”; as they pass in my mind I hear the roar of jet engines. Speaking of aerial demonstrations, today's traditional Indy 500 military jet flyover was performed by civilian aircraft this year. “Sequestration” mandated DOD budget cuts has grounded all military flight demos including the Thunderbirds & Blue Angels. These cuts will also affect the MCAS Miramar Air Show with which we have been involved for years. What’s happening for 2013? Although the Blues won’t fly the base is still pressing forward to plan and execute the show. The final decision will be made in July. 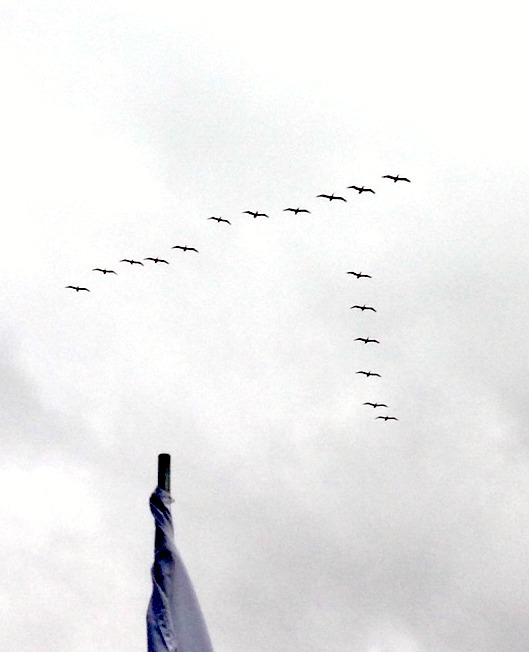 As for the pelicans I’m glad they’re ignoring Sequestration memo. Their budgets are in order. 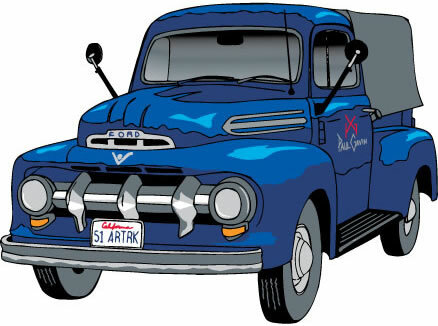 Many people have noted that for the last two weekends my art and I have been at the San Clemente Pier the 51 Ford Art Truck is nowhere to be seen. First of all, thank you for noticing and asking. The simple explanation is an electrical problem, and those who own or work with vehicles knows, an electrical problem is never really “simple” especially those with the authentic 6-volt system. Although it appears to have been resolved, I am giving the truck a few more daytime trips to ensure all is consistently good. It is dark in the morning when I drive to the pier and I return home at night. Headlights and the electric overdrive pull a lot of current and I would hate to have a malfunction that would keep me from getting to the “office” on time, or especially after such a long day, getting home to bed! It will be back soon and thanks again for asking. If you swing by next weekend it should be there. 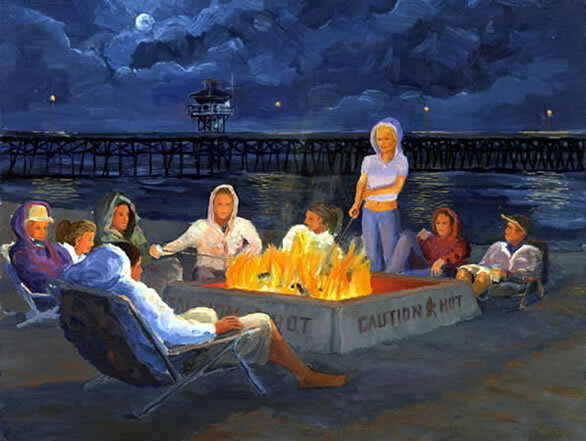 Last week someone pointed to my Beach Fire painting (“S’more Fun in San Clemente”) and said, “That might soon be only a memory.” Who would ever have thought that the wonderful and soul warming tradition of sitting around a beach bon fire at the end of a summer day would ever not be possible? The fun, the food, and the romance of those times are deep in the memories of every beach goer. Surfing, swimming or playing volleyball and then coming in and sitting around the fire and eating a freshly cooked burger, hot dog or corn on the cob or any other creative culinary delight and then later marshmallows or full on s’mores. Most memorable was sitting in front of the fire with your girl or boyfriend wrapping a towel or blanket as the moon rises and moves across the sky. The whole beach experience will not be the same without them. The latest? As per a May 20th Wall Street Journal article the South Coast AQMD board postponed a vote on the ban scheduled for June 7. No new date has been set. Interested? Get more information or make your thoughts known to the Board at the South Coast AQMD web site, http://www.aqmd.gov. 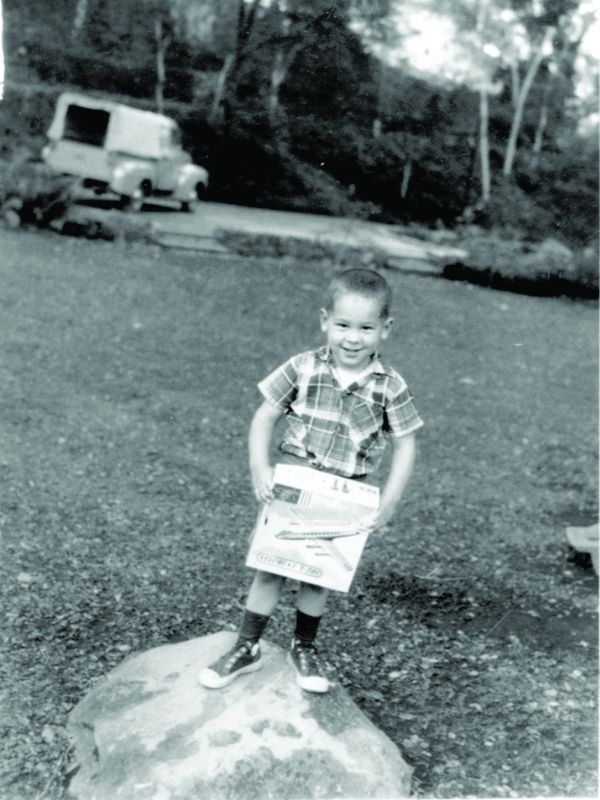 Paul at four years old holding a model airplane. His future trademark Ford F1 Pickup is behind him. Many have asked how we started supporting the military with our work. It actually began before I was 3. We lived in Sacramento near the flight path of civilian and military airports. Trying to draw airplanes flying overhead I still remember actually seeing a B36 and thinking how huge it was. In 1957 we moved to OC. I was four and what an “aircraft bonanza” it was! We lived near both the Marine Corps Air Stations Tustin and El Toro. MCAS Tustin, the Blimp Hangars (also know as LTA - Lighter Than Air) was the Marine Corp's helicopter base, and MCAS El Toro was the fixed wing base. I drew planes and helicopters for years. Our neighbors were Marine Corps families. There was an awareness of the Vietnam War that became clearer the older I got. So did how poorly veterans were treated during and after the war. I loved the huge Blimp Hangars. While painting Orange County landscapes in the late 1970's they and MCAS El Toro were prominent in the orchards and fields of the Irvine Ranch. This led to paintings of the bases and supporting the Marines and events of MCAS Tustin, then the MCAS El Toro Air Shows and then military events across the country. 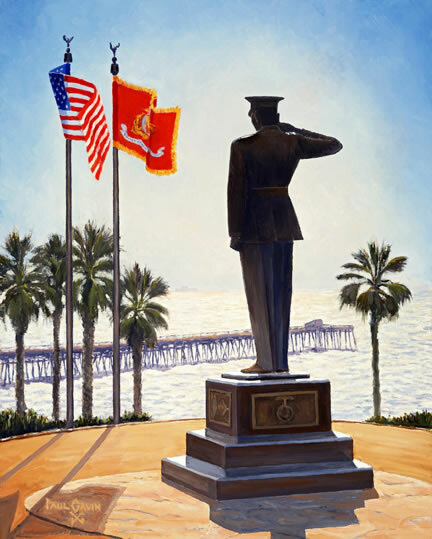 Kimberleigh also grew up in Tustin with Marine Corps families and when we married in 1993 she joined me in doing art to support the military. I married a girl that not only understood and supported the military but also one that drew airplanes and very well! Did you ever go to the El Toro Air Show? Did you know that it was the largest and most attended Military Air Show in the Country? Do you miss it? If so the Marines moved south and the MCAS Miramar Air Show happens in October each year. (We also do that event design.) Interested? Check the official Miramar Air Show web site. Watching a sunset in the San Clemente Pier Bowl area is a magical experience. Each one different and always beautiful every night is a work of art. 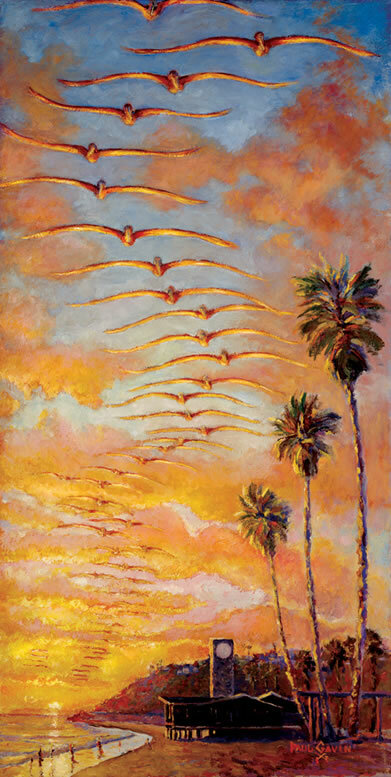 Twenty-four years ago I moved my studio to San Clemente from Huntington Beach and I am very fortunate to display my work at the Fisherman’s Restaurant on the San Clemente Pier. Although I paint many subjects in many places, every weekend, weather permitting and if we have no special events, I return to paint and display my art and on the pier and just take in and enjoy the beach life and color. 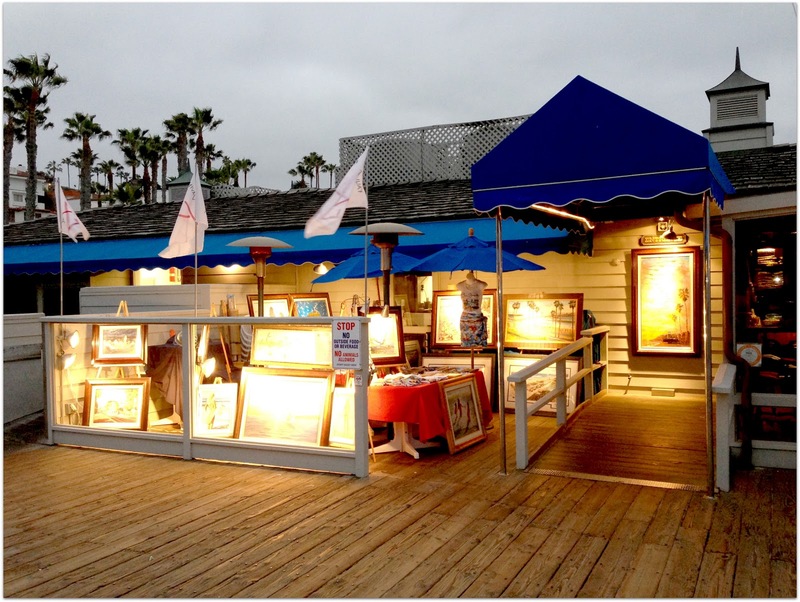 Come visit me at the pier - my display is at the entrance of the Fisherman's Restaurant.